I love pizza - any kind of pizza. Traditional Italian style, Chicago deep dish, New York, Californian, and even those bagel pizzas. To me, every type of pizza has its charm. Sure, there are days where I feel like one type of pizza more than another, but in the end, I can't say that I dislike any of them. To me, the key of making pizza is the dough - generally this is what differentiates one pizza from the next. Pizza Hut's pan pizzas are particularly appealing to me as they have a crisp exterior and spongy interior. When I saw this recipe to recreate the pan pizza at home, I had to give it a try. The April/May 2006 issue of Cook's Country Magazine had a couple of recipes that I really wanted to try: Pepperoni Pan Pizza and Oven-Fried Onion Rings. I tried the Pan Pizza first. It took me almost two hours to make this recipe the first time I tried it. The second go around was closer to ninety minutes from start to finish. I started off by gathering up the ingredients I'd need for the pizza dough: 2 tablespoons (30 mL) extra virgin olive oil, 7 ounces (205 mL) nonfat milk, 2 teaspoons (8.4 g) granulated sugar, 2-1/3 cup all-purpose flour (please read on for clarification), 1 package (1/4 ounce or 7 g) active dry yeast, and 1/2 teaspoon (3 g) table salt. I knew from experience that Cook's Illustrated and Cook's Country do not use the USDA standard of 125 g per cup of flour (which is based on the sifted flour mass and is the conversion I typically use on this website). They assume you are measuring flour by the scoop-and-level method and that your bag of flour has settled somewhat, but not to its maximum reasonable compressibility (which has a density around 160 g per cup). At least in Baking Illustrated, the editors thought it would be helpful to include weights (in ounces) - but not in Cook's Country where this recipe comes from. After a little trial and error, I settled upon 140 g per cup of flour or a total of 330 g all-purpose flour (which is closer to 2-2/3 cup than 2-1/3 cup). So, you'll see the 2-2/3 cup (330 g) all-purpose flour in the recipe summary. I heated the milk in the microwave to about 110°F (43°C). If you've got a Thermapen available, this is a great use for it because the readings are fast and accurate. On my microwave, this took about 45 seconds. I also preheated my oven to 200°F (95°C) to provide a warm chamber for my dough to rise in. Once the oven reached 200°F, I turned it off and kept the door closed for it to cool slowly. I mixed the olive oil, sugar, and milk together and slowly poured it into the flour mixture as the mixer continued to rotate on low speed. I then increased the speed to medium-low and let the dough hook do its magic. 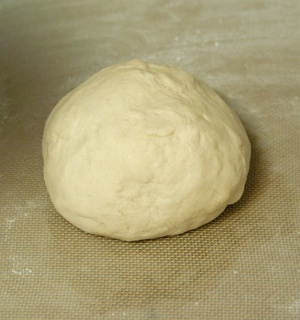 After five minutes of kneading, the surface of the dough had what baker's describe as a smooth (almost powdery) texture. This is not an easy thing to write about and even with the picture, it's going to be hard for an inexperienced baker to determine what I mean. Cook's Country says the dough will be shiny, but I'm not sure what that means - it's rare that I see dough with these ingredients forming a surface capable of sharp specular reflections. So, just look for relatively smooth. The tactile feel of the surface should be slightly tacky, but not sticky. Grabbing the dough should not leave dough pieces on your (dry) hand. Sticking your finger into the dough will, however, cause dough to stick to your finger (especially to your knuckle hair if you have it - which you should wash well or else when the dough dries you may inadvertently pull out knuckle hair when rubbing you hands). I removed the dough from the mixing bowl and formed it into a ball (with my hands). I'm working on a lightly floured silicone baking mat because it provides a relatively non-stick surface. Wet dough sticks to everything (including non-stick stuff), but once it dries a little it won't stick to the mat. In this case, after five minutes of machine kneading, the dough should be in such a condition that it doesn't stick to the baking mat. As a little added insurance, the baking mat is lightly floured. To lightly flour the mat, just take a few pinches of flour and throw it on the mat. Then use the palms of your hand and rub it all over. It'll be easy to tell what's been coated with a thin layer of flour and what hasn't. Working with a tiny bit of flour on the surface makes the dough easier to work with (the surface of the dough that touches the flour will pick up that little bit and that part of the dough will be temporarily drier and easier to work with). Such a small amount of flour will not affect the final consistency of the dough because it will hydrate pretty quickly and isn�t enough to alter the ingredient proportions in any measurable way. I rubbed a thin layer of olive oil to the inside of a large bowl. Then I set the dough ball into the bowl, covered with plastic wrap, and placed it in the warm (but turned off) oven to rise for thirty minutes. We grease the bowl to prevent the dough from sticking to it. If the dough sticks to the sides of the bowl, it will somewhat inhibit the rising of the dough and that's bad. If there's a seam to your ball of dough, this should be placed on the bottom of the bowl to prevent excess gases from escaping as the dough rises. 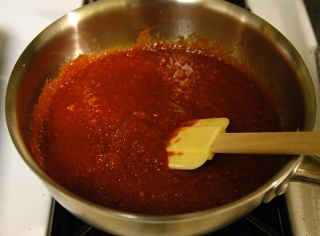 While the dough was rising, I needed to make some pizza sauce. Store bought pizza sauce works just fine, but I opted to try the supplemental recipe in Cook's Country. I minced two cloves of garlic and put them in a saucepan with 1 tablespoon (15 mL) extra virgin olive oil. The saucepan was heated over low heat until the garlic was fragrant but not yet browned (about two minutes). Then I added a 28-ounce can of crushed tomatoes. This was cooked on medium until heated through and slightly thickened - about twenty minutes. This makes way too much pizza sauce - enough for six pizzas (maybe even eight). I'd scale the recipe down, but unfortunately, in my part of the United States, I can't seem to find crushed tomatoes in cans smaller than 28 ounces. Why crushed tomatoes? Crushed tomatoes are a canned product which is a mix of pureed tomatoes and diced tomatoes. Because pureed tomatoes are fully cooked, they have a fairly bland taste when compared to diced tomatoes which have only been blanched. The crushed tomato product combines these two into one convenient can. Most crushed tomato cans also contain salt, so I didn't have to add any to my pizza sauce. I took two 9-in. round cake pans and poured three tablespoons (45 mL) extra virgin olive oil into each pan. It seems like a lot of olive oil to add to the pan, but the pizza doesn't taste oily when it's done. It does give a nice perfectly crispy texture to the crust. Speaking of round cake pans, you do have two identical ones, right? It almost seems pointless to own one round cake pan as most cake recipes (and in this case, pan pizza recipes) are designed for two. Why? So you can layer the cakes - one round is just too short and squat. So, if you haven't bought round cake pans or need new ones, remember to buy them in pairs. After I pulled the dough out of the oven, I split the dough in half and formed each into a ball. I flattened each ball into a round circle. I did this by hand, but Cook's Country recommends using a rolling pin. I didn't think it was necessary to dirty another tool. When the pizza dough was just a little smaller than the cake pan (9 inches in diameter), I picked it up and positioned my hands underneath the dough, holding the dough up with my fists. I guess it's sort of like adopting a defensive boxing position but with pizza dough draped over your hands. I then stretched the dough using my knuckles and the weight of the dough. (Sorry, no pictures - my hands were covered in dough.) Once the dough was a little bigger than the cake pan, I laid it on top of the olive oil and positioned it nicely within the pan. The elasticity of the dough pulled back a little to create almost a perfect fit. I did the same to the other dough and round cake pan. If you're not fast at shaping dough, simply cover the unused piece of dough with plastic wrap to keep it from drying out while you patiently work your dough into the desired shape. 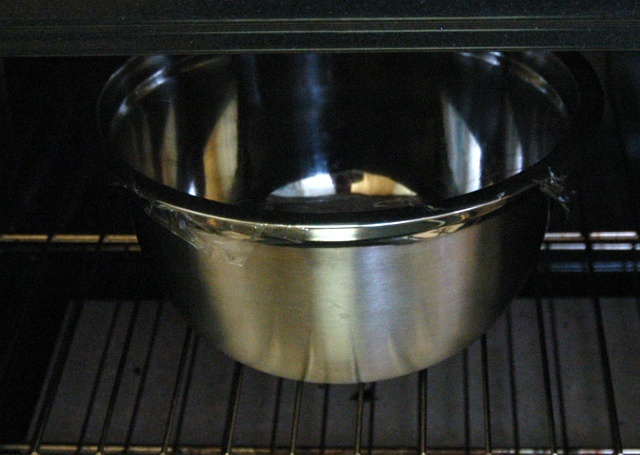 Cover the cake pans with plastic wrap and place in a warm place (such as the slowly cooling oven) for twenty minutes to rise. Now it's time to deal with the pepperoni and cheese. During this last rise time, it's a good idea to grate some mozzarella or run to the store and buy a bag of the pre-grated cheese. Normally, I'd scoff at the idea of using pre-grated cheese because a lot of ingredients are added to grated cheese to prevent clumping and mold growth. These extraneous ingredients can usually be tasted, but on a pizza with strong flavors like tomato sauce and pepperoni, this is not really going to be a problem. Also, pre-grated cheeses are typically lower in moisture which works very well on a pizza. Pepperoni is very fatty. This fat becomes liquid and flows freely when heated, which is exactly what's going to happen as the pizza cooks in the oven. So, the fat needs to be removed prior to baking or else the top of your pizza will be a giant pool of orange oil. Cook's Country solves this problem by microwaving. I usually get rid of the oil by heating the pepperoni in a pan. I did it the Cook's Country way this time. 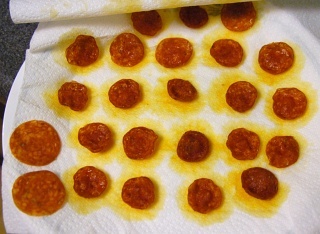 I laid out sliced pepperoni on a plate lined with a paper towel. I then covered the pepperoni with another paper towel and microwaved for thirty seconds. Thirty seconds may have been a few seconds too long as some of my pepperoni was quite dry, but the oil was cooked out of the pepperoni and in record time. To accomplish the same goal, it usually takes several minutes on a pan. In the picture I show two pepperoni slices that have not been cooked (far left) as compared to the microwaved pepperoni. Once the dough has risen a bit and fully conformed to the cake pan, it's time to top the pizzas. Increase the oven temperature to 400°F and top the pizzas while the oven preheats. The Cook's Country recipe is for a plain pepperoni pizza, but I thought a little green could make the pizza a bit more colorful and flavorful. I did this by adding thin strips of julienned Anaheim chiles. First, a layer of pizza sauce needs to be added. The magazine's article said that the pizza sauce recipe was good for four pizzas, so I was determined to use a quarter of the sauce for each of the pizzas. This is a very bad idea because too much pizza sauce makes the pizza soggy and the toppings slide off as you eat the pizza. So, use a moderate amount of sauce - just enough to coat the pizza dough but not cover it. This means you'll have a lot of pizza sauce left over. I applied the pizza sauce in a circle extending from the center to almost the edge of the pizza, leaving about 1 cm of untouched dough along the circumference. Next, I topped the pizza with 1 cup grated mozzarella cheese (a mix of mozzarella and cheddar also works well) followed by the toppings of my choice (pepperoni and Anaheim chiles). If using toppings that are high in oil (like Italian sausage) or water (like mushrooms), it's necessary to cook them first to extract the oil and water so the liquid isn't deposited on top of the pizza. All raw toppings that can't normally be consumed raw should also be cooked first (e.g. chicken, ground beef, etc.). I baked the pizzas in the 400°F oven on a rack set in the center position for twenty minutes - when the cheese fully melts and just starts to brown at the edges. After pulling the pizzas out of the oven and allowing them to rest a couple minutes, I cut them into quarters and served. The crust was flavorful (although not quite the same flavor as Pizza Hut's) and the texture was dead on - crispy on the bottom and fluffy and chewy on the inside. Having all that extra pizza sauce means I'm going to have to make more pizzas, but with this recipe for pan pizza, I don't mind at all. 3 Tbs. (45 mL) extra virgin olive oil coat bottom of 9-in. round cake pan lay dough on top of oil in pan let rise 20 minutes lightly coat leaving 1-cm circumference uncoated sprinkle liberally lay pepperoni to cover cheese bake 400°F (205°C) 20 min. I don't have a dough hook attachment for my mixer, so I make all of my bread dough manually. About how long do you think this dough would be kneaded by hand? I'm guessing around 10-ish minutes. If you don't have a dough hook on your stand mixer, just incorporate the liquids and solids using a wooden spoon or a stiff spatula (I like using silicone because it cleans up pretty easily). When the dough comes together into a scrappy ball, just put that onto a lightly floured surface and knead. Proper kneading technique involves pushing with the palms of your hands away from your body, dragging part of the dough with your palm. The idea is to create friction as you push against the dough. Then fold over the part that you pushed out and push again. Every couple times you push and fold, rotate the dough 90&3176; and repeat. 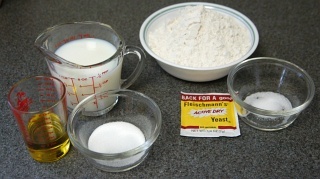 Do this for about ten minutes (use a watch or a clock - time will feel like it's slowing down while you knead the dough). The surface of the dough should not be sticky and should be fairly smooth by this point in time. I used to make pizza like this all the time (I don't have as much time between when I get home and when I serve dinner now that I have a two-year-old). I recommend adding a couple of teaspoons of chopped garlic with the olive oil - it gives a very nice flavor to the crust. I too made this recipe from Cook's Country, and while I had a less successful sauce, I found the dough to be almost spot-on once it had been baked-- very tasty. It rose a little thick, though, so I think I'm going to work harder next time at getting the center area of the dough thinner and make the crust thicker. The pepperoni par-cooking is such a benefit-- I picked that up from Cook's Country's little "send in your own tips" section at the front a couple months ago, and I'm glad to see that the Test Kitchen folks have integrated it into their recipes! Another tip I picked up was, instead of warming an oven up, I throw a half-full (or slightly more) mug of water into the back corner of the microwave and heat it until boiling or nearly so. Leave it in there and, when it's time for the dough to rise, put the oiled bowl in there containing the dough and covered with a tea-towel or plastic wrap. The hot water will warm the whole microwave for several hours-- I heat up the water again when bench-proofing (dough rising in the pans-- I stack them with a piece of cardboard in between to keep them separate). The obvious drawback is doing without your microwave for the duration of the rise, so you have to work around it for the pepperoni thing. At any rate, the whole recipe was awesome, and as of last night (another pizza-making frenzy for work potluck) I have about a quart of really good slow-simmered sauce to put to work, so I'll make pan pizza again quite soon. I bet when she gave me those cakepans for Christmas, my sister thought I'd be baking cake, but I've only made pizza in them! Any good recommendations on substituting whole wheat flour? Maybe half and half? The weights might not work out? I love the idea of pre-cooking the pepperoni. One thing I've found to be really helpful is pre-baking the dough for a few minutes before putting on the sauce and toppings. Otherwise, I have problems where the dough is still too doughy underneath all the toppings, requiring eating it with a fork, or cooking it so long that the edges start to burn. For those that would consider this route, be warned! Some ovens will accelerate the 'golden-brown'-itude of your outside crust and leave you with perfect inside dough and a super crusty outside! Not quite the flaky quality you may desire. A suggestion: Melt some butter/margarine or use a light oil to coat the outer rim of crust. This will mitigate some baking acceleration. Also, depending on how you spice this coating (garlic, salted, whatever), you may well add some extra kick to your crust! I make a similar pan pizza, but use a pre-heated 12" cast iron skillet. This gives me a crisp outer layer to a chewy crust. easy sauce for two pizza without the large can of tomatoes, 1 can tomatoe soup, 1 small can of tomatoe puree, spices - usually 2 garlic cloves, dried oregano 1 tsp, dried basil leaves 1 tsp, 1 TBSP sugar, and 2 TBSP vinegar(better with red wine vinegar) mix together and add salt and pepper to taste. Commercial sauces are often lacking in taste(spice). Can also use crushed chili flakes for more spice or grated parmasean cheese. Has anyone tried this at high altitudes? I live in Los Alamos, New Mexico (~7000 ft above sea level) and am curious what adjustments, if any, might need to be made. --Flour tends to be drier on the shelf and dries out more quickly at high altitude. I've read that you should be conservative with the flour, as you'll probably use 1/4 to 1/3 cup less flour than the recipe calls for (for the given amount of water) for a dough of this size. Aside from your altitude, the fact that you're in dry country should be reason enough for dry flour. --Dough rises faster, so ignore whatever times the recipes suggest and catch it when it has doubled. If it was a really short rise, punch it down aggressively and let it rise again-- more flavor that way. --Dough dries out faster, so when you've put it down for a rise, make sure it's completely coated in oil (helps prevent the "skin" that forms on doughs that dry out) and you might even dampen the tea-towel or washcloth you throw over the bowl. 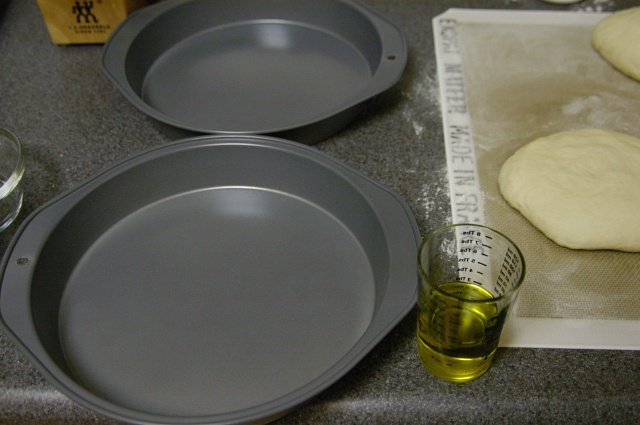 Another possibility is using plastic wrap to cover the oiled bowl/dough while the dough rises, and put the plastic wrap in contact with the dough to eliminate even more air. (This is also good for anything that forms a skin (e.g. pudding) when left in contact with the air.) If you put it aside for any reason, do something to keep the moisture in. I don't know about baking temperature-- what I've read says that you add 25F for quickbreads and such, but don't do so for yeast breads. You might have to experiment a bit with temp and time. Thank you for sharing your exquisite attention to detail with those of us, while process hogs, don't always get things "right." I am and will continue to be a Cooks Illustrated fan, but you make them look downright sloppy. Specifically, in this test, you point out the actual gram measurement of a cup of flour. I have always wondered why Cooks doesn't do this, as well. Of course it can make the difference between almost and a-ha! Your pictures, precise timing, target temps for cooking processes and equipment layouts allow me to be mucho mise-en-place avoiding the distraction and frustration of mid-cooking foraging around. And you give measurements of salt and pepper. A blessing. "To taste" causes me to panic. You have made my quest for great cooking much more satisfying. Details matter! The correct name is peperoni, with only one P.
And peperoni is the translation for capsicum (or, as you say, Anaheim chiles)!!!!! The red slices are named SALAME. So, the recipe you are trying to do is PIZZA with SALAME or, if you wish, PIZZA with SALAME and PEPERONI. Subject: Re: SALAME, not PEPERONI! have you tried putting the pepperoni on first? not really a good idea for thin crust, but for pan pizza i top the shell with a layer of pepperoni, then add sauce, and then top with cheese. yes, there is more oil, but that brings some of the flavor from the sauce into the crust. it also leaves more room for toppings... like crumbled bacon, onions, and freshly diced tomatoes. WOW...impressive set up, never seen a site like this... i love researching recipies and seeing how they are done. It's very rare to come across something this detailed and well presented. im not a kitchen iliterate...i just like to see every aspect of something before i jump in and experiment. i love the scientific approach and sense of knowledge behind the preperations/ingredients...wow. I noticed "dirtgirl" mentioned that the crust is firm or the inside is soggy - its really a compromise, unless you experiement a bit. I am curious to hear other opinions on this, since I myself am fighting this problem. 3) adding 100% wheat gluten, in attempt to emulate store bought (yuck!) dough. The wheat glueten gives some resiliance to the dough, and it will retalliate kneading. I think you can freeze the pizza dough at the point where it enters the pans (my mother makes pizza quite often, but not pan pizza, and freezes it in balls before rolling it out). Then if you take it out of the freezer in the morning and defrost it out of the fridge all day, it has a) defrosted and b) risen by the evening. Good if you want a quick pizza when you come home. I'll have to try your method and see if it works with pan pizza, too. Subject: Question About Pizza Dough? Love your blog! Have you tried making this recipe with bread flour? I made it twice with AP flour but will try bread flour next time as we like the crust to be a little bit chewier. Thank you so much for your recipe M. Chu. cook another pan pizza this week-end because it had alot of success! I worked for and managed Pizza Hut from 1983 to 1992. I don't have much to add in terms of ingredients, but the process is very important to make original pan Pizza. The recipe I saw posted here for Pan Pizza dough looks to be fairly close. I never needed to kneed the dough. Once the dough is put out on the table , cover it and let it set for about 5 minutes. I'm not sure abought the measurements here, but I believe 16 oz. of dough makes a 12 inch pizza. After you portion the dough roll it into a ball, spray it lightly with pam and cover for 5 minutes. While you're waiting, put about 1/8 inch of vegatable oil into a 12 inch pan. The pan depth should be around 1.5 to 2 inches deep. Now roll out the dough ball intto a circle. It should be about 1/4 inch in height once rolled. Now place the rolled out dough into the pizza pan on top of the oil. Turn the dough in the pan 1/4 turn to ensure proper oil distribution. Now spray the outer edge of the dough with apray release. Cover the pan and placein a lightly warm oven for abought 45 minutes or until the dough is very close to the cover. Once the dough has finished proofing, place the pan of dough in the fridge for about and hours. The will suspend dough proofing and firms up the dough and makes it easier to spoon the sauce on. Refrigerated pan dough is good for abought 8 hours. 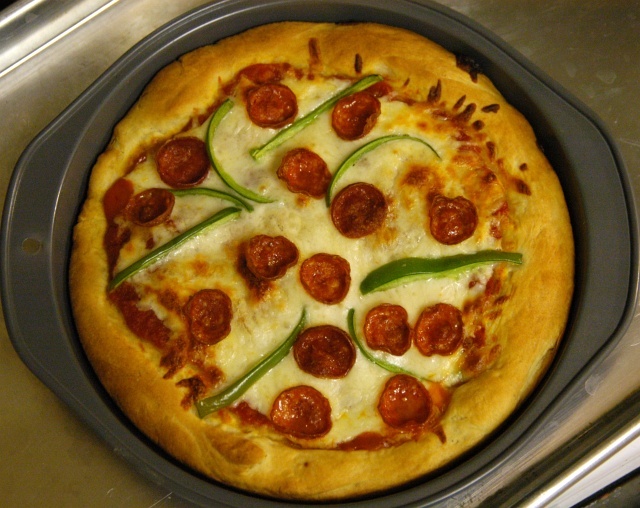 Pizza Hut uses hot air injected ovens to achieve even cooking. A convection oven would probably do better than a conventional oven. If you like to load your pizza down, then lower the oven temp a little and cook for a longer time. 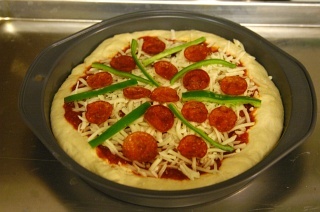 After you top your pan pizza, spray the outer edge of the dough again with spray release to help brown the crust. Has anyone tried using an unglazed quarry tile as a pizza stone? I'm eager to try that, but I'm not sure about the pros and cons of buying cookware from the hardware store. I haven't tried that. I can only think of two risks. It may not withstand rapid heating and cooling, or there may be something in the gaze that becomes caustic at certain temperatures. Might be worth a try. I use an $14 unglazed 18-in. square travertine tile that fits on the bottom of my oven almost perfectly. I only remove it when I utilize the self cleaning option (which is once in three years). The travertine tile cracked on the first heating, but still holds together (and is too heavy for me to want to move). I don't usually bake directly on the stone because I find results are just as good if I use a piece of parchment paper cut to size. The parchment paper doesn't catch fire or burn if it's not sticking out too much and the results are as fine as any other pizza stone I've used. I have been visiting your site for a while, and I really like the way you aproach things: maybe just because it's "Cooking for Engineers", and after years of work as engineer you get used to see things a certain way. As regards pizza making, there is basically no official recipe for the dough: every region in italy and every pizza shop has his own tricks and secrets, so that you can find a variety of pizza stiles. To my experience, the best results are achieved with natural yeast, or with very little yeast quantities (2g per 1000g of flour...) and very long proofing times: there are some reactions going on -it's basically a fermentation- that take time to develop. But dry yeast will do if you are on a hurry or you don't want to start your pizza making th day before! As regards the ingredients, I prefer to use just plain water instead of milk (50%in weight of the flour), it makes your pizza more crispy (and you avoid unnecessary fat addiction), but it's a matter of taste. The way I proceed is slightly different: I usally start to mix flour yeasty and sugar, add the olive oil and keep on mixing. At this point I start adding water slowly, and just before the whole mmixture clumps together I add the salt: this is just to have the yeast doing his work properly, as salt is reducing it's action; so whatever you do avoid to have yeast getting in touch with salt. To spread the dough, do it directly in the pan: form a disk, put in the pan you have slightly oiled, and spread it with your hands, this will give you a softer result, and is much faster as well. To have a crispy result try to use some malt instead of sugar, it will give a nice brown crust. As regards cooking your pizza the refractory stone makes sense if you are making thin and crispy pizza (like what you get in a pizzeria in Italy), for a pan pizza a conventional oven is suitable. I do not like the effect of convection ovens in pizza making as you may get a burned surface and an uncooked pizza at the middle of the pan: I sitch it on if I need to dry out the topping (watery mozzarella chees for example). Sorry for my english, I hope I did not annoy anyone. I go to any pizza place (one you like) and they will sell you enough dough for a pizza. Too much to go thru all that trouble to make your own. Then I carmalize 3 onions and place them on the uncooked pizza; chop up a can of anchovies and sprinkle them on it. Then add some cut up artichokes and anything else you like. If you don't want to make your own dough, you can buy regular or whole wheat dough at Trader Joes, if it's in your area. But really, once you've made it a couple of times it is very easy and pretty quick. Has anyone tried making large batches and freezing the extra? Do you need to mix smaller batches, or can you double the recipe? We didn't hear back from him. I guess it didn't go so well. Would self rising flour make that much of a difference? Self rising flour contains salt and baking powder. The baking powder will through the balance of ingredients off and could produce an off taste with nothing to neutralize it. The baking powder could also react with any acid in the dough. Both things will make it taste funny. The type of flour you use, be it bread flour, cake flour, all purpose flour or self rising flour will make a world of difference in how your baked good come out. The use of other ingredients aside, the textures will be different on all of them. If I double the recipe for the crust, do I need to use two packs of yeast? In my experience, yes. You need a certain number of yeast organisms in the flour/dough mixture to make it rise in the time range specified in the recipe. Waiting for the yeast to reproduce to double their numbers to produce the needed CO2 to leaven the dough could take more then enough time for other characteristics of the dough to change. You probably won't get enough rise without the extra yeast. If you like a thin crisp dough, you may be ok with less yeast. Just made this pizza tonight, on a whim, and with no prior pizza-making experience, and it turned out great! Everyone loved the crust and home made tomato sauce as well. The worst part was making a huge mess and not being prepared with my ingredients. I didn't let the dough rise in the pans for an additional 20 minutes, but it still turned out very tasty and a nice texture. I'll have to experiment with that. Keep up the great work with the website, love the recipes and the presentation! Bread flour makes the best pizza dough. For everything else, I use unbleached white flour. Subject: Deep Dish Pizza Crust? Is this dough recipe suitable for use a deep dish pizza crust? Subject: Re: Deep Dish Pizza Crust? Nice recipe but it can really be improved upon. The difference between good pizza and great pizza is the crust. Interestingly enough, technique is more important than the ingredients in achieving a world class dough/crust. The dough contains bread flour, water, salt and yeast. The pies I make are anywhere from 11 to 16 oz for a 16 inch pie. The 11 oz produces a paper thin crust which if you keep the toppings on the dry side produces a crispy marvel. 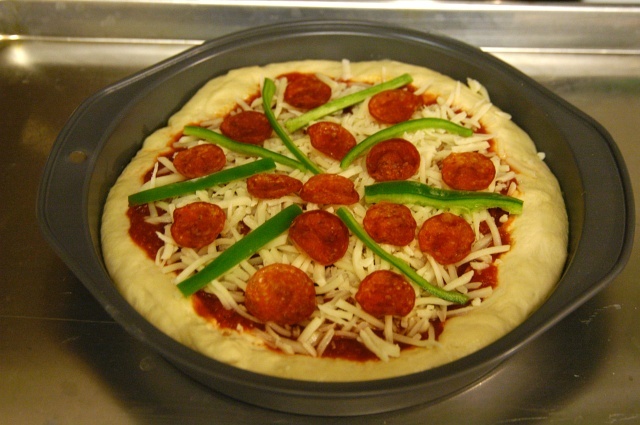 The 16 oz produces the conventional pizza parlor ny pizza. The trick is to kneed the dough to produce the a window pane. It should be on the dry side - tacky not sticky. Upon kneading the dough let rise till double, then bench and form dougn balls of the required weitht and place into oiled covered bowls. Let rise on the table for half hour then place in the refrigerator for at leat 5 hours but not necessary to do more than 10. When ready to bake: dont use rolling pin- spread out with finger and fist by letting the weight of the dough stretch itself in the air being careful not to disturb the edges of the crust. Your toppings should be on the dry side so that pies is not soggy. If you use fresh mozzarella chease- salt it and let sit on paper towels to dry out a bit. Bake in the oven at 550 for 7 to 9 minutes. You will get an incredibly cripy blistered crust like you have never had before. I have been making pizza for about 10 years- so be patient and experiment. And above all keep it simple- it is after all a peasant dish. Really? This is a really good approximation of the Pizza Hut Pan Pizza... Can it be better (better = closer to the pizza hut crust since that's the goal of this particular recipe)? Possibly, but not the way you described. You will get an incredibly cripy blistered crust like you have never had before. I have been making pizza for about 10 years- so be patient and experiment. And above all keep it simple- it is after all a peasant dish. That sounds like great pizza... Unfortunately, that's not how a pizza hut crust is and so it fails at the goal. I was not responding to your pizza hut recipe. Frankly any estblishment that fills the crust with cheese is not worth takiing about. Have a happy new year and ..... lighten up. Next time I probably won't use quite as much oil in the pan... I thought the crust was a little greasy for my taste, and the flavor of the EVOO was strong, but otherwise it was delicious and surprisingly fast! For the person who asked, Yes, you can use half whole wheat flour. If you shop around you can even find whole wheat bread flour. It won't taste the same, but you can't really expect it to. I add a little flax seed to my dough too. 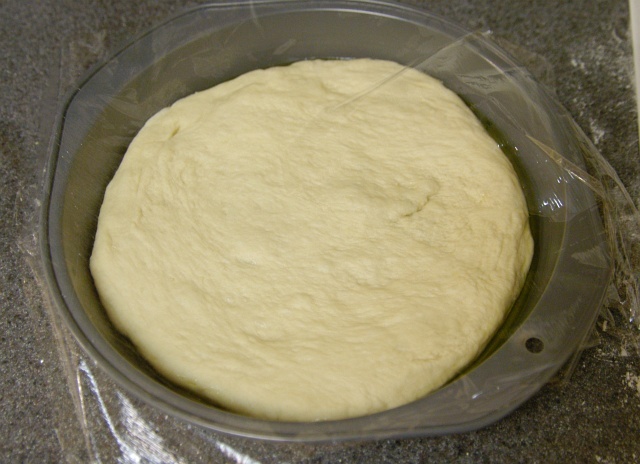 You can freeze pizza dough. I make individual rounds of dough and stack them in a round container, separated by oiled disposable plastic plates. I put the whole thing in the freezer, then move it to the fridge the day before I plan to use it. I even take it camping with me. I put it in the cooler. Throw the rounds of dough on the grill a couple at a time, flip them over, top them quickly, and there you have it grilled pizza. I agree with your Pizza Hut comment completely. It's big businesses like them that have ruined cooking. I tried their stuffed crust pizza one time and I wasn't impressed at all. Hi there! Love the web site! I have a quick question. Nowhere in the recipe do you say if you proof the yeast or not. If you do, how much water do you add to it??? Thanks so much and happy baking!!! Nowhere in the recipe do you say if you proof the yeast or not. If you do, how much water do you add to it??? I used Active Dry yeast which does not need proofing. "Lancelot" and is available on line in 3 lb bags. They make numerous flours but you will not see their "Sir Lancelot" in the local market. If there is a Gordon Food Service store in your state (check the yellow pages) they carry 14 % flour. that is where I bought mine, in Florida. I bought a 25 lb bag for $13.99. They had two choices. The one I bought is called "Bouncer". It makes a great crust. 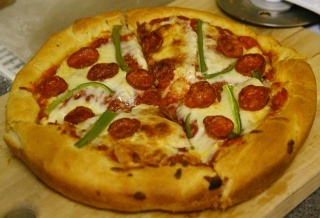 For thin crust use 1/4 tsp rapid rise yeast to 2-2 2/3 cups flour. Let proof to double in size in refrigerator. Takes 2-3 days to achieve this doubling but allows time for proper fermentat and flavor development. This recipe seems to fail for me when I get to the second part of making the dough (splitting it in two, and putting it back in the oven to rise). It doesn't rise any more! Since I'm new to bread-making, what could I be doing wrong? .....what could I be doing wrong? I've followed this recipe many times with good results. But the last time, the cooking oil we had on hand was Smart Balance Omega. 1/ Lose the sugar unless you're the kinda cook who substitutes Campbell's condensed tomato soup for the sauce. It's really only a cheap shot way of browning the pizza without the requisite BTU's. 2/ "Extra Virgin" on the olive oil can means very little. The key words to look for are "First Cold Pressed". 3/ Line the bottom of your oven with firebricks (NOT tiles, but bricks used to line a fireplace or a blast furnace). Nothing like thermal mass to bring an oven to life. It takes a lot longer to get the oven up to temperature, but it is worth the wait. Temperature? 500�F. 4/ Bake off the pizza in a cast iron skillet placed directly on the firebrick. I don't have a mixer as they suggest using to make the dough. 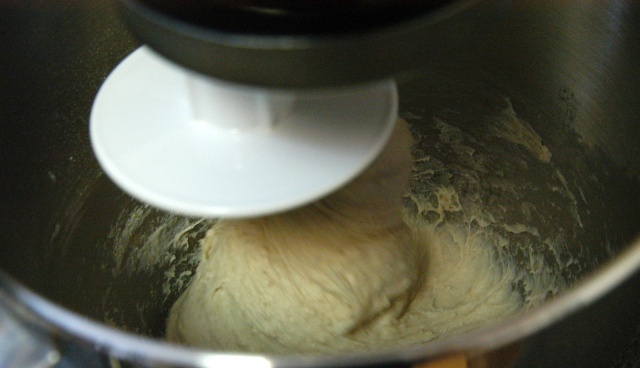 Instead, I used my bread maker on the dough setting which is what I always use to make pizza dough. I had guests over, and everyone really liked this pizza! The dough came out great. It's even easier in a bread maker, and you can elimate the step about proofing in the oven. I find that you can remove the excess fat that is left on the top of the pizza by applying the towel directly to it once it's cooked - the only problem is if there is lots of tomato sauce coming though the cheese - in which case it will pick up some of that as well. I have been using your receipe except cooking on a stone. I have been spreading the dough out on an aluminum pizza peel. Directions for using the aluminum pizza peel, suggest using corn meal or semolina to keep the dough from sticking to the peel. This is so after you have preheated the stone you transfer the prepped pizza from the peel to the stone. My problem is the dough keeps sticking to the peel and doesn't want to slide onto the stone. My thinking is that as I strecth the dough it is exposing areas that don't have any corn meal and is sticking to the peel. Any suggestions. try making your dough on a floured+cornmeal surface - not directly on the aluminum peel. that way you can shuffle the dough around on a surface to ensure it's loose and moves with the cornmeal, then lift an edge and slide the peel under. the problem with aluminum peels is they just don't "retain" any flour dusting, cornmeal splash, etc. it all "runs off" vs a wood peel or wood working surface . . . I'd say it was better than pizza hut's pan pizza. A few things I did differently: for the milk, i used half milk and half water. Didn't use as much oil in the pan... and i also spread olive oil on the crust then sprinkled it with granulated garlic and permesan cheese, which gave the crust a good flavor. I love this recipe, but I'm surprised that it uses olive oil. Olive oil, which is great usually, adds a fruity flavor to the dough that really doesn't taste at all like Pizza Hut. The Pizza Hut website has the ingredients list for their products, and they list Soybean Oil or Cottonseed Oil as their oil of choice, which are both neutrally flavored oils. I used peanut oil the second time I made this recipe, which was much closer to what you get from the restaurant. Other than that, thanks a lot for this recipe! It really sates that junk-food deep dish pizza urge for much cheaper than ordering out! I made the pan pizza recipe and baked the pizza last night. As for ease and taste, the dough was great. I made it in my food processor with the dough blade (I have a heavy duty food processor, don't try that with a little one). I did a double rise in the oven (punching down in between) simply as I had a lot of time to kill. When I baked them I did load them down, I'll admit, but the crust just wasn't quite done at the thickest part (done in the center but not toward the outside rim on the bottom). I only had 8" cake pans which possibly also caused trouble. I did 22 minutes at 400�F - should I raise the temp or lengthen the baking time? Everything else was great, toppings were hot, cheese bubbly, etc. This was honestly the easiest pizza dough recipe I've ever used. Hardly even got my hands dirty. As for making it more like Pizza Hut pan pizza (also a favorite), you might try some garlic or onion salt in the dough, there is definitely some additional flavor. Also, it could have a lot to do with cooking it in a super-hot professional oven. Like true Chinese food, it's just not possible to obtain that much heat in a home kitchen. If you are going to make just a couple of pizzas and do not want a lot of leftover sauce, Hunts makes a nice tomato sauce (actual sauce, not paste). It comes in a very small can, about 8 ounces, and it comes in flavors. I like the Basil, Garlic, and Oregano, but I think they have roasted Garlic and other flavors also. I find it is just enough for about 3 small pizzas--and it is very inexpensive. You can also get real pan pizza pans rather than using cake pans (which have kind of a high side and might mess the crust up a bit. Instawares will sell to the public, though they might be slow in shipping if they don't have an open box to take just a few pans out for your order. My daughter, the engineer, makes small pizzas from a similar recipe. She does like to pre-brown a bit, and does brush the crust with olive oil first. It is a bit crispy, but since we use a lot of sauce and cheese, it seems to even out in the second baking. isn't 330 grams of flour equivalent to about 11.64 ounces which is a little over a 1 1/2 cup of all purpose flour? where does the 2-2/3 cup come in? i really like the sound of your recipe and i'd like to make it as accurately as possible! This is exactly why I measure all flour on a scale. 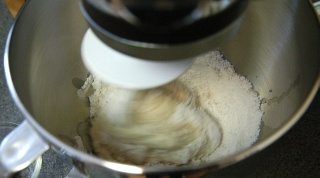 Flour settles and becomes more dense. All flour volume measurements (unless from a prepublished recipe) on this site should be assuming sifted flour - the only way we can get any consistency when measuring flour by volume. Sifted flour is about 140 g per US cup. The flour that comes in a bag at the grocery store is labeled as pre-sifted which is not much use since after sifting it has settled. The total amount of settling depends on length of time and how it was handled. Commonly, you'll see this flour weigh in at 160g to 220g per cup. That makes recipes really hard to replicate since you don't know how much settling was assumed by the recipe writer. I don't know why they don't clarify this in cookbooks - either the author doesn't realize the difference (seems really hard to believe that) or doesn't care (also hard to believe). Pastry cookbooks and baking cookbooks will often specify sifted flour and encourage the use of scales. I have a similar dough recipe but just use water instead of the milk. I can see how the milk can add a new flavor to the dough, but would there be a big difference if i used whole/2% milk instead of the nonfat? I personally never buy nonfat milk and wouldnt want to buy it just for this recipe. Would it really affect the consistency of the dough a lot? I have made this pizza many times and it always tastes great. I think it belongs in the Recipe File, not Test Recipes. Please reconsider. I loved this recipe the first time I made it, and am making it for the second time tonight. However, the pizzas are in the oven now and I realized I missed the step of the second rise, because it wasn't in the grid. (My first time through a recipe I work from the detailed directions, and if I decide it gets a second chance, I print the recipe or in your case, just the grid.) So, tonight I made the recipe from the grid, and missed the second rise. I'm sure it will still be edible, just not as fluffy. I made a note on my copy, but you might want to update the grid to show that step! Love the site and your food reviews on Orthogonal Thought! Sorry about that! I've fixed the recipe table to reflect the second rise (in the pan). Subject: What happened to my crust? I've made this recipe many times and it's my favorite homemade crust. Tonight, something went wrong. The crust came out looking beautiful and golden brown as usual, but the texture was all wrong. It was spongy and soft instead of airy and crispy. Any idea what might cause this? Thanks! hey, couldn't help but notice an error you made in paragraph 4 - 200 F is closer to 90 degrees centigrade than the 65 degrees you listed. Thanks for catching that. I've fixed the error. Subject: So glad I found your site! Recently got into making oven pan cakes and then I got the idea for the pan pizza; which brought me here! Never would have guessed there was such a place. After reading the reviews/comments, know it has saved me some time. My kids are so excited to make this tonight! Anyhow, I know I'll be back for more recipe fun. Thanks a bunch! the baking of a microwave is the convection right? Subject: Pan Pizza, Pizza Hut style! Awesomly simple and super yummy recipe!!! made pizza as per this recipe and I was SURPRISED to see such results!! That has made me post my thanks to author for posting this.!! many many thanks.. From India. I tried your recipe. Worked perfectly. Thanks to that. What is more confusing to me is, I have been searching for good hamburger bun recipe and got the king arthur hotdog bun recipe here http://www.kingarthurflour.com/recipes/hamburger-or-hot-dog-buns-recipe. your pizza dough recipe is exactly same as the the hot dog bun recipe(few little variations). How come the pizza has a hard crust while bun has very soft spongy and fluffy texture? the (inadvertent) period at the end cause the included link to fail. next, I would not agree the recipes are "exactly same"
the proportions of the various ingredients in a baking recipe - often called a 'formula' - perhaps implying a bit more of preciseness . . . - can drastically affect the final product. setting aside the baking technique, for the moment. you may have heard of "baker's percentages" - used for scaling formula - virtually everything "else" - liquids & solids is measured as a percentage of the flour used. these two recipes / formulas are not with "few little variations"
fats tend to make a dough softer; sugars tend to make a dough moister. add: pizza is baked at "max" temp - 800'F+ commercially, 500'F in the home oven. hamburger rolls, significantly lower temps. I finally stumbled upon the best way to cook my Pizza. heat the oven to 500 degrees- Voila! Thin crusts bake in 11-12 mins and deep dish takes 15 mins. The glazed tile costs about $1.50; a glazed baking stone about $50. The heat is distributed very evenly; no turning necessary. Pizza hut cooks pizzas at 650� + sometimes800-900 thats how to cook pizza as well.